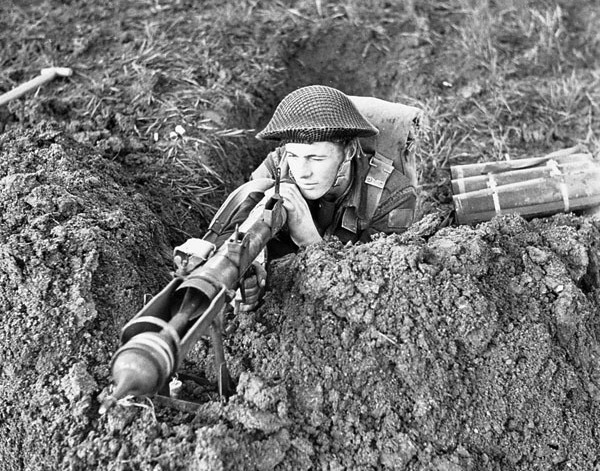 Private Edmund Arsenault of The West Nova Scotia Regiment aiming a PIAT anti-tank weapon from a slit trench near Ortona, Italy, 10 January 1944. LAC 3222597. 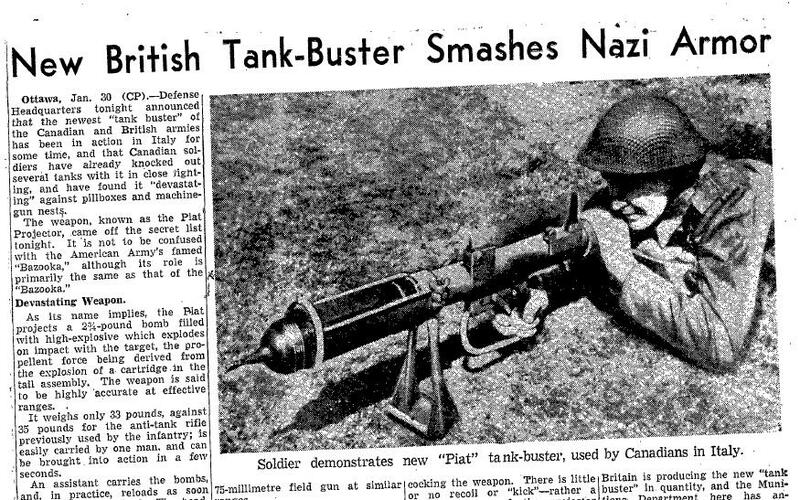 The PIAT (Projector Infantry Anti-Tank) was the only portable anti-tank weapon available to the British and Canadian infantry. It was notoriously unreliable but with luck, at short ranges it could prove effective. On 14 December a German Mk IV special controlled the road emerging from behind a house to fire on the lead “Van Doo” platoon. The Ontario Regiment Sherman tanks were well behind, stuck on the muddy track. Using the shelter of olive groves Lieut. M. Richard and his men stalked the tank but the PIAT malfunctioned and Richard was wounded. A second PIAT was brought forward and after a dash toward the platoon Sergeant J.P. Rousseau fired the PIAT at a range of 33 yards, penetrating the tank and setting off explosions which scattered tank parts across the ground. Two other German tanks appeared at close range but the PIAT was now inoperable. With the arrival of the Ontario Regiment tanks the enemy armour was routed and the advance began. 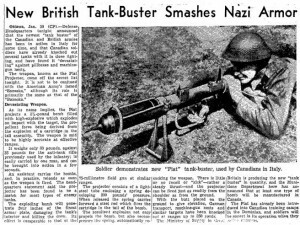 Click to read a newspaper article about the PIAT in “New British Tank-Buster Smashes Nazi Armor” from the Globe and Mail, 31 January 1944 (Canadian War Museum, Democracy at War Collection).